In 2007, I had problems with mildew on my sinningias for the first time. It started on Sinningia richii, and some time later spread to other soft-green-leaved plants of the corytholoma clade, namely S. defoliata, S. araneosa, and S. nordestina x araneosa. In 2009, other plants were affected, such as the dark-leaved form of S. barbata. 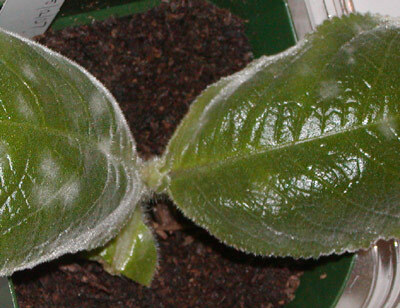 Plants of other leaf types and other clades were not attacked until, eventually, some mildew appeared on S. hirsuta (sinningia clade). Seedlings of Corytoplectus capitatus were attacked in January of 2011. Don Mahoney, of the San Francisco Botanic Garden (formerly Strybing Arboretum), noted that the Garden complies with organic standards and thus cannot use remedies that don't qualify as organic. One teaspoon sodium bicarbonate (baking soda). 768 (say, 700-800) parts water. One part sodium bicarbonate (baking soda). Presumably the oil and soap are to make the mixture stick, and the sodium bicarbonate has some effect (such as changing the pH) to make the leaf surface inhospitable to mildew organisms. Ingrid Lindskog mentioned that she published a similar recipe in Gesneriastnytt. Mike Kartuz recommended potassium bicarbonate, but I have not been able to find a convenient source for that. Apparently, this is a remedy which has been known for at least a couple of decades, but now I have my own experience with it. I can report that this stuff works! First, it doesn't damage the leaves. Of course, the mildew itself has damaged the leaf where it is growing, but the spray does not itself harm the leaves of the plants to which I have applied it. Probably, one can apply too much, but so far the amounts I have applied have not caused any problems. Second, it actually gets rid of mildew. Usually one spraying has been enough, but in a couple of cases, I had to spray other leaves on the same plant. I have used it on (among other plants) Sinningia richii, Sinningia barbata "Tancredo Neves", and Corytoplectus capitatus. Just mix up the recipe above, pour it into a spray bottle, take the plant to an appropriate area, and spray until the affected leaves are completely wet. Try not to let the spray drip onto the soil. After a few sprayings, the buildup of sodium in the soil might be harmful to the plant. This may be the reason for recommending potassium carbonate, as mentioned above, since potassium is a nutrient rather than a harmful salt. For that reason, it is helpful to spray in a location (such as a sink) where the plant can be tilted so that the runoff from the leaves drips somewhere it won't make a mess. It has become quite clear that mildew spores are always with us. They are in the air, on our clothing, on our light stands, on our plants, and probably in our noses. Thus any strategy based on quarantines, isolation, fire lanes, and sterilization is doomed to fail. Instead we need to start from the assumption that mildew spores will reach our plants. They will germinate and attack every one of our plants. We already know that most of our plants resist this attack. Our task is to raise this resistance rate to 100%. Sinningia richii has proved a good test case for mildew prevention. A number of skilled growers have been tackling the "Robson Lopes" form of this species, prized for its yellow flowers. Most of these growers have experienced the susceptibility of this species to mildew (the phrase "mildew magnet" has been used frequently). One thing which has been noticed is that plants grown in high humidity are not more likely to get mildew. This might be contrary to what one would expect, if mildew were thought of as a result of dampness. Vigorous, healthy plants resist mildew better, regardless of environment. It doesn't seem plausible that S. richii is heavily attacked by mildew in its native habitat. If it were, it would have evolved resistance or been exterminated. Therefore the challenge is to find the right conditions to grow plants which will be healthy enough to resist fungal attack. Experimentation is the key. Try things and learn. Countermeasures are good in the short run. But in the long run, we need to figure out how to thwart mildew before it can get going.